When it comes to home-grown fruit, nothing could be easier than figs. Cultivated for thousands of years, figs can remain fruitful for many generations. There are about 470 varieties of common figs—the ones we grow in the southeast. Two of the most commonly available and highly recommended figs for us are ‘Brown Turkey’ and ‘Celeste.’ ‘Brown Turkey’ produces purplish brown figs that occur over several months. It’s winter hardy to 10 degrees F. ‘Celeste’ bears smaller, violet-brown skinned fruit. The tree itself is more winter hardy than ‘Brown Turkey,’ capable of surviving temperatures as low as 0 degrees F. Both varieties produce excellent fruits that can be eaten fresh; however, ‘Celeste’ figs have more culinary versatility: the fruit can be dried or processed in preserves, glazed tortes, and compote. Figs are not like those “no pain-no gain plants.” In fact, its seems unfair to expend so little effort to reap so many tasty rewards. Because they demand so little from their caregivers, you should plant one or two in your garden. Figs prefer a well-drained, full sun location. Depending on the variety, some are more cold hardy than others. For protection from winter winds and cold temperatures, marginally cold-hardy figs should be planted on the south-facing side of your home close to a heat-absorbing brick or stone wall. Figs have the potential for reaching heights of 15 to 30 feet or more, but they can easily be maintained at 6 feet, which keeps the fruit within reach. They sucker quite easily, so you should pay attention to controlling or at least accommodating their rampant spread. Fig trees are light feeders, requiring little or no fertilizer. Fertilize your fig when the leaves appear off-colored and smaller than normal, and when it produces less than a foot of growth a year. Any complete fertilizer will be fine, such as a 10-10-10 applied when growth begins in the spring. If necessary, a second application can be made in early summer. Although figs are heat-tolerant and can cope with dry periods, watering during exceptionally droughty summers will prevent them from shedding their fruit. If you’re looking for a great tasting fig, take a look at my fact sheet titled “Fig” at the Clemson Extension Home & Garden Information Center web site. Of course, visit your favorite garden center or nursery now when the figs are fruiting. Let your palette decide which variety deserves to be in your landscape. Since figs make great passalong plants, make friends with someone who’s already growing them. My ‘Brown Turkey’ came from a friend in Seneca, SC about nine years ago. After I pruned his 20 foot tall tree in late winter, he tried to pay me for the exercise. I declined the money, but took a branch home with me instead. I dug a trench about 6 to 8 inches deep, placed the limb on the bottom so the branches rose slightly above the ground, and filled it in. It leafed out and grew the first year. In the following year, I was eating figs in my backyard. You don’t have to cram an eight foot limb in your trunk like I did. Dig up and transplant suckers, or take 8- to 10-inch long cuttings of one-year-old wood in early spring. Set the cuttings in a prepared bed so one or two buds on the tip are above the ground. Let them grow for a season before transplanting them. For the past three summers the scarcity of rain coupled with my reluctance to water resulted in a mediocre crop. Fortunately, this summer was different. I’ve got a bumper crop of figs and I’m the only one in my family who relishes the sweet, soft fruits. Sure, I have to compete with the birds and insects, but thankfully, there’s plenty of figs for everyone. Dr. Michael Dirr was followed by Rick Crowder of Hawksridge Farms who presented “New plants worth waiting for!”. He regaled us with an incredible arrays of plants that included the fastigiate Japanese maple ‘Tsukasa Silhouette’, the purple leaf form of chloranthus (Saracandra glabra), an evergreen shrub whose new purple-colored leaves mature to green with a hint of purplish-bronze, and Rosy Ridge Carolina silverbell (Halesia tetraptera ‘Rosy Ridge’), a specimen that’s in it’s first leaf at the SC Botanical Garden in Clemson. By the way, Rick Crowder received the 2013 Don Shadow Award of Excellence for his involvement and quest for developing and introducing new plants to the market. After this dazzling array of woody shrubs, trees, vines, and ground covers, John Hoffman, owner of Hoffman Nursery in Rougemont, NC, grounded us with a breathtaking collection of grasses and sedges. It’s “cool to be a monocot” as evidenced by so many stunning selections, such as Red October Bluestem (Andropogon gerardii ‘Red October’), whose leaves turn intense red in the fall after the first frost, Blonde Ambition mosquito grass (Bouteloua gracilis ‘Blonde Ambition) with blue-green leaves and chartreuse flowers that turn blonde. Mr. Hoffman included my favorites: the muhly grasses, especially pink muhly (Muhlenbergia capillaris), a southeastern favorite that explodes in the Fall with jaw-dropping pink cloudlike plumes. Now northern gardeners in USDA Cold Hardiness Zones 5-6 can enjoy the cold-tolerant M. capillaris ‘Aurora Borealis.’ Northwind switchgrass (Panicum virgatum ‘Northwind’) is another beaut that was chosen as the 2014 Perennial Plant Association Plant of the Year. Hoffman showed us some wonderful sedges that tolerat shade to sun, wet to dry soils, and can be used as ground covers or lawn alternatives. Sadly, there are consumers who feel that “sedge” is a pejorative term–a shortened version of yellow and purple nutsedge, that pernicious weed of lawns and landscapes. I’ve become a serious fan of sedges after my encounter with a hillside planting at the Scott Arboretum of Swarthmore College in 2006, one of the tour stops at the annual Garden Writers Association Symposium. The Pennsylvania sedge (Carex pensylvanica) with its narrow, arching leaves that created the illusion of movement as it flowed down and across the slope. Hoffman’s EverColor® series of sedges intrigued me, but these three sedges stole my heart: Carex lurida, which boasts “high ornamental value” and functionality because of its tolerance to temporary flooding. Lurid sedge can be used in rain gardens and meadows. As I’ve seen firsthand, C. pensylvanica is a suitable alternative to lawn grasses and can also be used in woodland settings. Finally, the multipurpose, fine-textured Texas sedge (Carex texensis), is a drought and traffic tolerant sedge that can be used as a ground covers or for naturalizing and restoration projects. Steve Castorini of North Creek Nurseries presented an enchanting collection of herbaceous plants in “Sensational plants for southern gardens.” Sure, there are gobs of coral bells, several boasting heat tolerance and an affinity for southern gardens, but the heat-tolerant Heuchera ‘Circus’ is to die-for with colorful chartreuse to green springtime leaves with maroon veins and then transitions to multicolored leaves with shades of green, yellow, and pink. The magenta flowers are a n added bonus to the extraordinary cultivar. I also admired the tickseeds. Check out the Permathread™ & Big Bang™ series by Darrell Probst, such as C. ‘Red Satin’ Permathread™, C. ‘Cosmic Eye’ Big Bang™, C. ‘Redshift’ Big Bang™ PP20142, and C. ‘Galaxy’ Big Bang™. I’m more partial to the fine-textured threadleaf tickseeds. Mr. Castorini showed us the threadleaf coreopsis (C. verticillata Cruizin’ Series by ItSaul Plants: ‘Route 66’ Cruizin’), ‘Sunset Strip’ Cruizin’ , ‘Broad Street’ Cruizin’, ‘Electric Avenue’ Cruizin’, and ’Main Street’ Cruizin’. Many folks who come to the Southeast admire the giant mounds of pampas grass and their buxom plumes in fall-winter. However, they become disenchanted when they own their own clumps of pampas grass and have to cut those razor-sharp leaves down to within a foot of soil level to allow the new leaves to emerge in the Spring. PG owners have used chain saws—others have burned these large mounds of hay, which often severely dwarves or kills it (maybe it was their intention in the first place). Mr. Castorini suggested a kinder and gentler pampas grass alternative: Sporobolus wrightii ‘Windbreaker,” a southwestern U.S. native. Windbreaker big sacaton–yes, that’s it’s common name–should’ve been “Big Bubba” or “Big Daddy” for those of us in the South, because this common name aptly connotes its 7 to 8 ft. high and wide stature. Unfortunately, it lacks the bodacious, in-your-face plumes of PG. Finally, the second to last perennial in Castorini’s presentation floored me: Iron Butterfly narrow-leaf ironweed (Vernonia lettermannii ‘Iron Butterfly’), an 18 -24 in. tall cultivar that looks like a miniature Amsonia hubrichtii, is an Arkansas native that came from The Trial Gardens at the University of Georgia. I loved its finely textured leaves, its compact habit, and its late summer purple flowers. The 12th Southern Plant Conference held on August 5 at the Georgia International Convention Center in Atlanta, GA, was the greatest show on earth. Fifteen presenters, hand-picked by Don Shadow, internationally recognized plantsman and owner of Shadow Nursery, Inc. in Winchester, TN, spoke from 9:00 a.m. until 6:30 p.m. with an hour break for lunch. For me, it was a once-in-a-lifetime experience to see thi s austere group of individuals on stage at one time. The Southern Plant conference was book-ended by two legendary horticulturists now retired from the University of Georgia. Dr. Mike Dirr opened the event with his presentation titled ‘The realities of introducing new plants in a cluttered, competitive, combative market place.” As co-owner of Plant Introductions, Inc. in Bogart, GA. Dr. Dirr discussed his company and their introductions. Hydrangeas received a lot of face-time during his presentation. Remontant (reblooming) mopheads continue to dominate the market: according to Dr. Dirr, mopheads are favored 10:1 over lacecaps by consumers (I happen to be in the minority). I was happy to learn that Hydrangea paniculata still has a niche in the marketplace. Having grown up with Pee Gee hydrangea, I can see how it “has come a long way baby” (to borrow a Philip Morris give-away-your-age slogan). The gangly, gargantuan Pee Gee (‘Grandiflora’), which can reach a height of 8-10 ft. in full sun and difficult conditions, has given rise to more compact, floriferous cultivars such as ‘PIIHP-I’ [Baby Lace™], which grows 3-4 ft. high and wide after 5 years. Although ‘PIIHP-I’ and other H. paniculata cultivars are small in stature, they’re still as tough as nails in the landscape. Dr. Dirr also discussed Distylium, a relative newcomer to the palette of southeastern landscape plants. He has selected hybrids of blueleaf isu tree (D. myricoides) and Isu tree ( D. racemosum) that include ‘PIIDIST-II’ [Blue Cascade™], ‘PIIDIST-I’ [Emerald Heights™]–Dirr’s substitute for ‘Schipkaensis’ cherrylaurel with bright green new leaves that turn lustrous, almost black-green (5 to 6 ft. high), and ‘Vintage Jade’ are introductions from McCorkle Nursery, Dearing, GA, and Plant Introductions, Inc. Dirr feels that Dystilium spp. 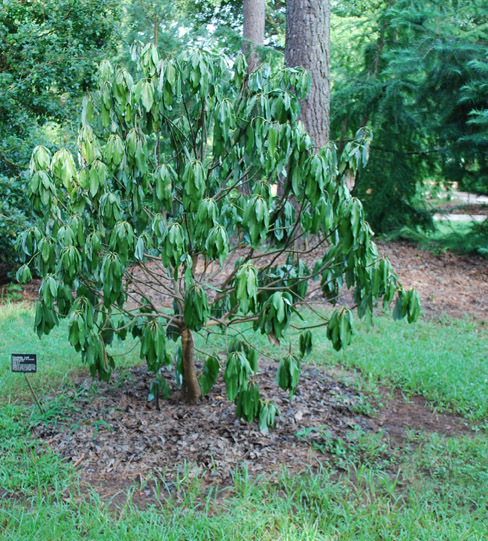 and hybrids will become sought-after substitutes for English cherrylaurel, which fall prey to shot-hole disease. Shot-hole disease—a complex that includes a bacteria (Xanthomonas prunii) and fungus (Blumeriella gaapi and/or Cercospora sp. 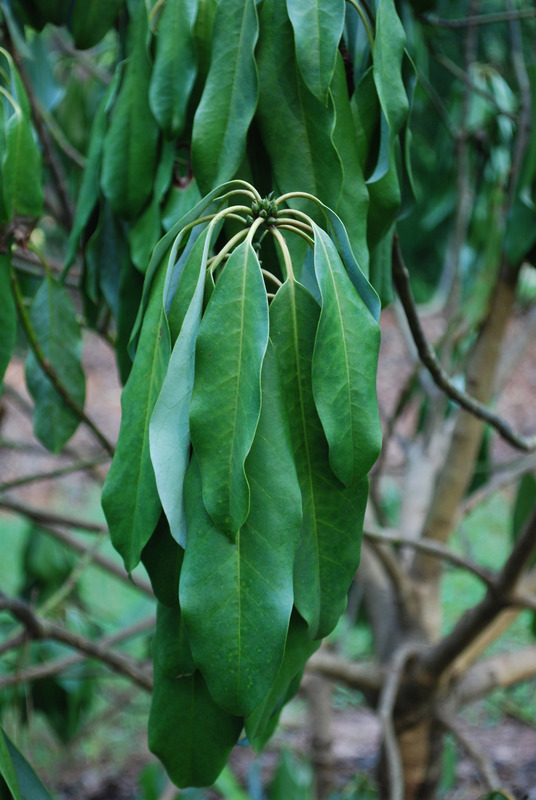 )–produces holes in the leaves and is exacerbated by overhead irrigation, which is often used in production nurseries. Despite its landscape merits, Dirr bemoaned the fact that Distylium has no marketing muscle to make it a “Garden Idol”. He spotted Linda Guy, partner of Plants Nouveau in the audience and asked her to recall her 2007 visit to his nursery where she viewed 21 Distylium selections with her husband, J. As described by Dirr in Nursery Management & Production* magazine, LInda thought the selections looked attractive, but she asked him: “‘Who knows Distylium? '” Dirr wrote in NMPro: “Her comment has haunted me since that day, but at one time, who heard of pink loropetalum, Encore azalea, remonatnat hydrangea, and Knock Out™ rose?” And so his crusade continues to make Distylium a bread-and-butter foundation plant. *April 2009, 25(4):40-43) article by Michael A. Dirr, “Distylium: hybrids in Georgia trials prove to be exciting shrubs with lustrous winter foliage”. Aug 11, 2013. Courtesy leaf (Daphniphyllum himalaense ssp. macropodum) shoots (left) and shrub succumbs to root rot in the SC Botanic Garden. So, having experienced the driest of times, I’m now facing the wettest of times. What’s wrong with too much water? The SC Botanic Garden in Clemson experienced the wrath of 8 inches of rain that fell late Friday night into Saturday morning (July 12-13). This torrential downpour was bookended by 20 inches of rain that fell 10 days before and rain that continued to fall almost daily afterwards. As a result of the erosive forces of rainwater, the SC Botanic Garden sustained $200,000 of damage. The cost to repair all of the damage from the rains is estimated to exceed $500,000. This summer our waterlogged soils have contributed to a number of large trees toppling-over because of their insecure footing. Trees that survived past years’ droughts sustained root damage and become especially vulnerable to falling. Sadly, a magnificent, 100-year-old bur oak (Quercus macrocarpa) on Bowman Field on the Clemson University campus—coined the “hammock tree” for the many students who caught some shut-eye in its boughs—fell around 3 o’clock on a quiet, perfectly calm afternoon. When I examined the root system of the tree to determine the cause of its failure, I was reminded of the importance of periodic inspections. I wrote about do-it-yourself tree inspections in my July 22 entry (“A routine check-up of trees saves lives and property”). Finally, these wet conditions have led to an increased occurrence of root rots. Various fungi fall under this category, including Phytophthora species, Rhizoctonia species and Pythium species. In the Southeast Phytophtora (means “plant destroyer”) is often the most common culprit, These deadly waterborne fungi attack a wide array of plants, including dogwood, deodar cedar, Fraser fir, white pine, and many others. These fungi are often found in wet or poorly drained sites; however, they’ll also attack plants in moderate to dry sites if they’re planted too deeply. Root rot symptoms include wilting, yellowing leaves. It may appear on a few branches or affect the entire crown. Scrape the bark near the crown and look for a reddish-brown discoloration where the fungus has moved into the stem. Examine the roots. The “outer skin” or cortex of the root can be slipped off easily like the paper-covering from a straw, leaving behind the threadlike core or stele (conducting tissue). Slice it open: a root rot-infected root is reddish-brown inside instead of healthy white in color. 1. Avoid planting in poorly drained sites. 2. Improve drainage in heavy clay soil by planting in slightly raised beds, or add organic matter such as composted pine bark prior to planting. Alternatively, raise the planting site by mounding the soil. This raised area will prevent the occurrence of “wet feet” or standing water. 3. Never plant shrubs or trees deeper than they were planted at the nursery. Prior to planting remove soil from the crown to expose the root flare and the uppermost structural roots.